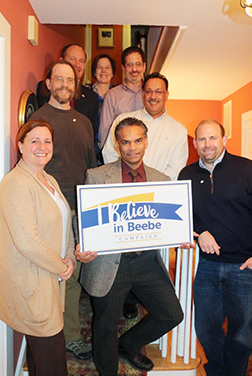 Physicians from Southern Delaware Imaging Associates (SDIA) recently gathered at Beebe Medical Foundation to celebrate the group’s generous $250,000 pledge to the “I Believe in Beebe” campaign. “We are lucky to be part of such a caring and competent healthcare team at Beebe, affording us the pleasure and privilege of working with highly skilled and compassionate technologists and nurses each and every day," said Ellen Bahtiarian, MD, board certified radiologist. As part of their gift, all of the SDIA partners have joined the 1916 Leadership Club and will celebrate Beebe’s founding year by donating $1,916 annually to support the hospital, said Judy Aliquo, CFRE, President & CEO of Beebe Medical Foundation. The “I Believe in Beebe” campaign is an historic campaign that is in support of the largest expansion in Beebe Healthcare’s 103-year history. The campaign is now in its public phase and Beebe Medical Foundation invites everyone to reach out to learn how to support the campaign and give to Beebe Healthcare, our Sussex County, not-for-profit, community healthcare system. “Gifts like the one given by SDIA truly make a difference and help us provide the state-of-the-art facilities to serve our patients,” Ms. Aliquo said. Pictured left to right, front to back: Kim Gardiner, MD, Michael Ramjattansingh, MD, Dennis Flamini, DO, Jeffrey McCann, MD, Maheep Goyal, MD. Andrew Dahlke, MD, Jeffrey Rose, MD, Ellen Bahtiarian, MD.